HomeBlogClick boardsAmbient 4 click: a sensor-click sensitive to light change. 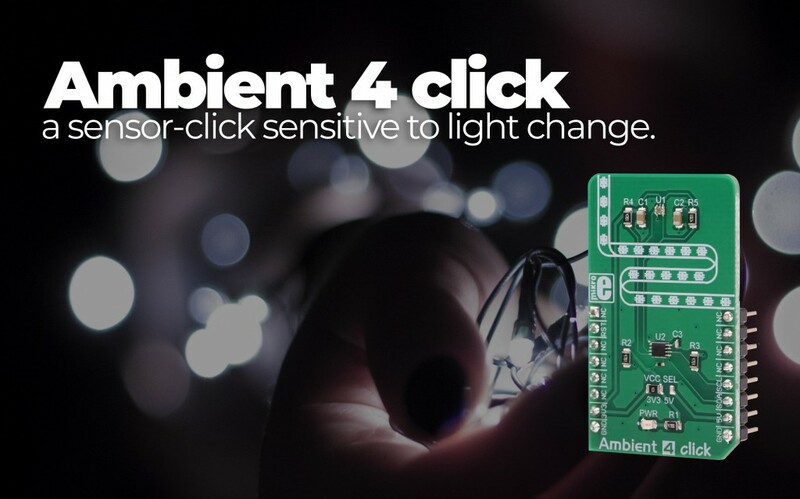 Ambient 4 click: a sensor-click sensitive to light change. Let us introduce you to Ambient 4 click. We just made a perfect light-sensing sensor click, sensitive to the tiniest changes of light, regardless of the source. With an amazing level of integration, it doesn’t require more than just a few of the external components. It leaves plenty of space to incorporate an additional level translating IC – you can rest assured that all of your data will be reliably transferred over the interface (which is the industry-standard, I2C). The influence of the light source type on the measurement accuracy is quite reduced. The sensor is capable of converting the light intensity from any type of light source, including daylight, fluorescent light, LED light, incandescent light, and so on. Its low power consumption, compact size, high sensitivity, and a high level of integration, make this sensor an ideal solution for both the IoT light-sensing applications and portable or handheld devices which utilize an accurate light intensity sensing. These include TFT/LCD screens, keypad backlight, cell phones, digital cameras, and others.